90-10 and 70-30 Cu-Ni’s are widely used in tubular heat exchangers and condensers for seawater, brackish water and fresh water. 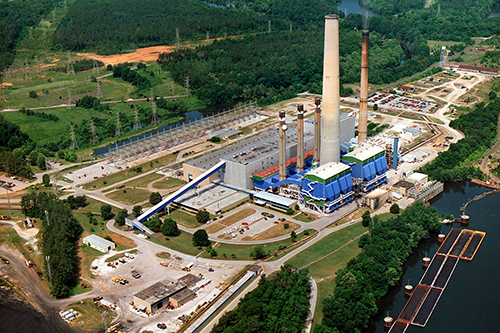 Power generation at the TVA Colbert facility. A protective layer on the water side of the tube must develop to achieve adequate corrosion resistance. The formation and maintenance of this layer is crucial for optimum tube life. It is also essential for trouble-free operations during commissioning, operations and after shutdowns. It takes about 8-10 weeks to develop a protective layer in clean, oxygenated seawater and the film becomes increasingly protective with time. Details are provided about forming and maintaining the protective layer, including commissioning, treatment and chemical reactions involved in depositing the protective layer. Water quality, including the presence or absence of oxygen, hydrogen sulfide and industrial pollutants (especially ammonia) has a significant effect on copper alloy performance. Abnormal films that form in polluted waters are less protective and more easily disrupted. Details are provided. Intake systems must prevent debris from lodging into or plugging-up tubes. Details are provided about grates, screens and strainers. 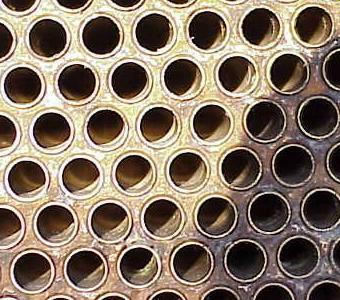 Corrosion resistance is essential in heat exchanger and piping systems. Details are provided about how corrosion resistance is affected by velocity, sand and silt, galvanic potential, pollution, dissolved and non-condensed gases, chlorine, marine biofouling, ferrous ion treatment, dealloying, crevice corrosion and stress corrosion cracking. Galvanic compatibility: Copper-nickel alloys are galvanically compatible with copper alloy tube sheets and waterboxes. Coated steel waterboxes can require supplemental cathodic protection and chlorine injection. Cathodic protection needed for waterboxes can negate the inherent biofouling resistance of copper nickel alloys. Details are provided. Mechanical tube cleaning – avoids sedimentation of the inner tube surface. Chemical cleaning – may include include chlorination. Minimum flow rates – prevent particle settling. Standby coolers and condensers – must be properly maintained. Shutdown maintenance – requires special procedures and precautions. The UK Ministry of Defence Standard 02-781; Issue 2 states that it is essential to keep flow rates within guidelines because "copper nickels can be subject to erosion corrosion when the shear stress caused by seawater flow on the protective surface film is sufficient to damage it. Measures are therefore required to limit flow within certain design limits and to avoid areas of local turbulence. Typical recommendations for maximum flow rates are given below and have been developed from manufacturer’s recommendations, published literature and international standards. Where necessary, however, due regard should be given to other design considerations (e.g. pressure drops versus pump discharge head, tube diameter) and flow rates should be adjusted accordingly." It is necessary to keep the minimum velocity in any tube above 0.9m/s at the lowest heat transfer demand anticipated so that sediment and particulate matter will be swept through and not deposited in the tube. Unremoved sediment reduces heat transfer and in time. Once the corrosion product film is fully formed somewhat higher velocities can be tolerated for short periods not exceeding 15% of total operating time. The water box and return head of two pass units must be designed so that the flow in any tube is within 25% of the average flow for the unit. In smaller heat exchangers, the waterbox and return head may require extra volume to provide good flow distribution to all tubes. For further information, see: "Protection of Seawater System Pipework and Heat Exchanger Tubes in HM Surface Ships and Submarines" in the Useful Links and References section below.